In a remarkable testament to human optimism, brand devotion, and hunger, patrons were, apparently, convinced their dinners would be ready soon. This is in spite of smoke pouring out of the place, employees fleeing the building, and approaching sirens. In fact, more people just kept pulling in. One can only assume they thought the column of smoke was coming from the grill. It wasn't until a total of 8 firetrucks had arrived that the hungry customers realized they should consider other dining options and left. A man in Zhangzou was hospitalized with fungal pneumonia. The potentially serious disorder has been attributed to his habit of repeatedly smelling his own socks after wearing them all day. He apparently did this as a way to relax after work. I think I'll stick with a beer. Mr. Onelio Hipolit-Gonzalez was arrested for running a bogus medical clinic. He charged people $160 for an initial appointment, which consisted of them holding a metal rod that was connected to a beeping machine (Ah! the machine that goes "PING!"). Afterwards he'd tell them the machine showed various organ problems and that he could cure them for $2000. His "cure" for diabetes apparently consisted of him drawing blood and then re-injecting it back into their body. Mr. Hipolit-Gonzalez was reportedly "shocked" to learn his actions were illegal, and, as proof of his ability to practice medicine, stated he'd been a lab technician. 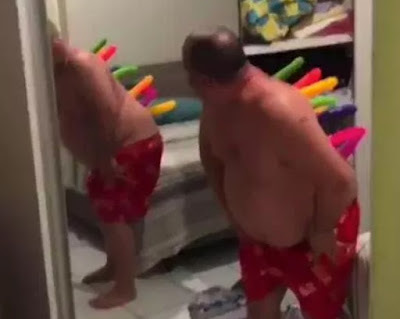 Mr. Abdias Melo, who must be a VERY sound sleeper, remained in dreamland while friends super-glued a colorful assortment of dildos to his back. They then woke him by banging pots together. Attempts to remove the dildos at home failed, and Mr. Melo ended up going to ER. I suspect even the most hardened team of emergency staff was taken aback by this case. Either that or he was mistaken for a stegosaurus. Of course, "kill" is too strong a word for what most doctors have done at some point, but still, he died because of my direct actions (a nurse and respiratory tech were involved, too). He was a retired farmer, around 80. Strong and healthy for his age. I was in my early 30's, just out of residency and starting life as a newly-minted attending physician. He'd fallen from a ladder and severed his upper cervical spinal cord. He was awake and alert, but completely paralyzed from the neck down. He couldn't breathe on his own, so was facing the rest of his life on a ventilator, requiring complete care for everything. There was no hope for recovery. In the first days of the injury the trauma and neurosurgery people worked their magic, stabilizing what was left of his neck, converting him quickly from a ventilator tube to a tracheostomy for comfort, getting a feeding tube in. As the days went by and we began decreasing his medications it became clear that he would live, was mentally intact, and could communicate with us. In spite of what his family had told us, he wanted to be let go. He'd led a robust life and didn't want to spend the rest of it in this condition. He was ready to have things turned off so he could pass. This sort of thing is (comparatively) easy in someone with advanced dementia, or severe brain trauma, or end-stage cancer. But in a guy who was fully awake and who'd been healthy and vigorous a few days earlier it was a whole different matter. The family was unhappy, but acquiesced to him. To cover myself I had a psychiatrist interview him and ordered a consult from the hospital ethics committee. All agreed that he was pleasant, had a good sense of humor, and was fully capable of making this decision. The family didn't want to be in the room when it happened, so we gave them all the time they needed to say goodbye. When the time came we chatted briefly, and he thanked me and the team who'd taken care of him. He even asked that we shake his hand. I had the nurse give him megadoses of morphine and Ativan, to put him to sleep and take away any pain that might still be there. Once he was out the respiratory tech disconnected him from the ventilator. Between the medications and his non-functioning diaphragm he went pretty quickly. I wrote a death note and moved on to another case. There are always more consults. What would you call it? An execution? Physician-assisted suicide? Compassion? I'm sure some out there would love to have me tried for murder, but I don't care. To me, my responsibility is to the patient. This man had lived a good life, wasn't suicidal in the sense of someone who's depressed, and made a rational decision about his own existence. I did everything I could to make sure there wasn't a good reason NOT to end his life, and did what I could to respect his wishes and relieve his suffering. That was the first, though not last, time I've had to face this situation. We may become more experienced, but it never gets easier. It's been 20 years, and I'd still say the same thing: In the end it wasn't my decision, it was his. I just did what was right for the patient. Mary: "Dr. Grumpy's office, this is Mary." Mr. Flurry: "Hi, I have an appointment later this morning, but am trapped at home by all the snow." Mary: "I understand, we can certainly reschedule it for later this week, or next. What times of day work best for you?" Mr. Flurry: "No, I'd really like to make this appointment. Isn't there some special doctor's line you can call or something, where they direct snow plows to my house and clear a route so I can get to the appointment?" Mary: "No sir, there is no such phone number." Mr. Flurry: "That's ridiculous. He's a doctor. Doesn't he know the governor, or mayor, or someone who can do that?" Mr. Flurry: "This is stupid. I thought he was a good doctor, but obviously my appointments there have been a waste of time."